Matt Hilton Thrills: Tales From The Fluffy Navel Raises It's Bemused Head. Tales From The Fluffy Navel Raises It's Bemused Head. Uh, is it that long since I updated my blog? Nothing major, except to say that Joe Hunter is still striding solidly on, as am I.
I've a couple of events upcoming in the next few months, where I hope to see/meet some of you along the way. I'll be at Bouchercon in Albany this September, and am also attending the inaugural Iceland Noir event in Reykjavik in November. I've always been fascinated with iceland as a country, and am looking forward to visiting, and have of course booked to go on a northern lights tour. With luck atmospheric conditions will be just right and I'll get to see a spectacle of nature. 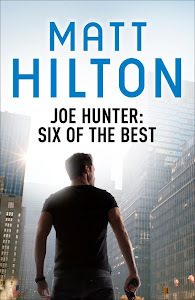 In the UK, Joe Hunter 8 - Rules of Honour - has recently been published in paperback format and I've been doing the rounds of publicity on that one. In the USA, book 5 - Blood and Ashes - is doing well I believe. The next book, Dead Men's Harvest, which sees the return of a foe from Hunter's past is due a late October release, and I look forward to hearing how readers enjoy the book. For British readers eagerly awaiting the next Hunter novel, book 9 - The Lawless Kind - will be released in hardback and ebook at the end of January 2014. Sounds a long way off, but, hey, it's September tomorrow already. Where do the days, weeks and months go to? I've had my head down and fingers tapping and hit the 80K mark on my latest work in progress. When I'm absorbed in my writing I often don't notice the passage of time, but still. This year is flying past. Right, I'm off back to the WIP, another planned 20K words to get on with. So, if you don't hear from me soon, that's the reason.